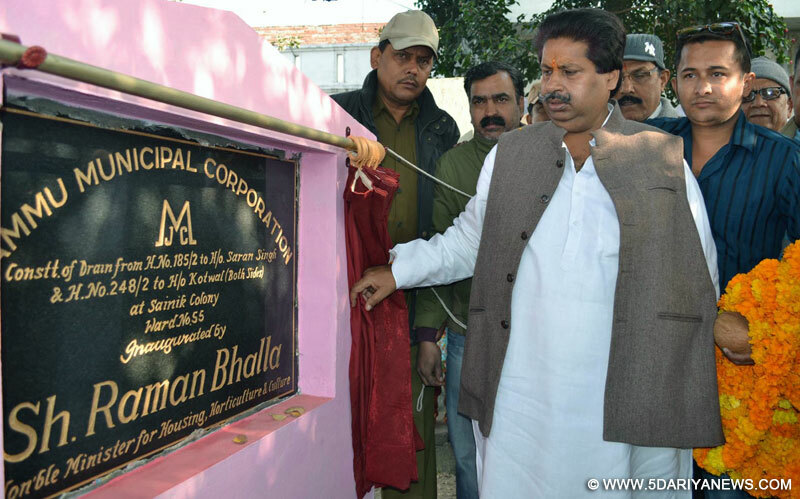 Minister for Housing, Horticulture and Culture, Raman Bhalla has said that Government is working on a comprehensive plan to develop every colony of urban as well as rural centres of the State on modern lines with all basic amenities.The Minister said this while interacting with the people after launching various development works at Ward No. 55 of Sainik Colony, here today.Managing Director Jammu and Kashmir Housing Board (JKHB) Mr. Ram Pal Sharma besides officers from JMC, PHE, PDD, R&B and JKHB accompanied the Minister. Mr. Bhalla asked the JMC to complete the development projects within stipulated time frame. He asked the officers to personally monitor the quality of ongoing works adding the Government was committed to provide concrete assets to the people across the State. Later, the Minister also visited Channi Himmat Sector No. 3, 4 and 7 and inspected the upgradation works of lanes, drains besides macademisation of link roads. Bhalla informed that for macademisation and modernisation of lanes and drains Government has earmarked Rs. 1.25 crore. The Minister asked JKHB to complete the work within 15 days to avoid inconvenience to the residents. He said Government was committed to develop every newly developed housing colonies of the State with all basic amenities like recreational park, safe drinking water, electricity and education, healthcare besides better roads, lanes and drains. He called upon the people to keep the surroundings clean and hygienic.Mr. Bhalla asked the JKHB to issue notices to those residents who put their building materials on road side or in recreational parks, adding that such practices not only make the area unhygienic but also create problems for passerby.The Minister said that Government has earmarked Rs. 3 crore for channelization of existing primary drains and construction of new secondary drains in Channi Himmat under JKUSDIP package. He said 3287 meter long R2 surface drain at Channi Himmat Sector-3 is under progress by Economic Reconstruction Agency and would be completed within stipulated time frame.Mr. Bhalla said that Government has earmarked Rs. 14.87 crore for channelization of R1, R2 and R3 nallahs, adding that works on the three projects are also under progress on war-footing and would be completed within stipulated time frame. He asked the ERA to use quality material on the development works, executed across the State under the sector.